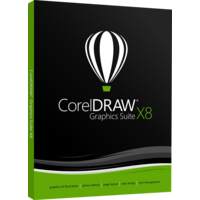 CorelDRAW Graphics Suite X8 is a graphic design product developed for graphics creation, photo editing and visual products creation. This product provides you digital power and gives you all necessary instruments to realize your vision of a project. The software features advanced supports of Windows 10, viewing of the project simultaneously on several displays, 4K support. The software is simple to comprehend and meets the needs and requirements of pro users and beginners letting them to achieve professional results. The X8 version of the software features enhanced compatibility. The version has become more stable and powerful. It can be installed and used on various popular PC and mobile platforms. Multi-monitor viewing of projects and 4K displays support. The software has got a new engine to support seamless performance and fast processing of large files. Moreover this release of the software supports pen-compatible tablets. This means that the process of editing and creation of graphics has become even more easier as you can now do everything with a pen in your hand. Corel fonts manager is an essential add-on to this CorelDRAW Graphics Suite X8 version allowing you to browse, explore, organize ad handle fonts to meet your typeface requirements. The option allows you to use specific fonts without a necessity to install them. The process of font choice and application has become overall simpler and clearer. The collections of fonts in the software has been upgraded and added to meet the needs of web designers, publishers and illustrators. Font filtering and search has become enhanced and improved. Now the users will not face a bulk of fonts to choose from. The interface has become simpler and the filtering option has become smarter. The search covers now all font folders kept on your PC. To find a font you need only to type in its name and the software will use it. Show objects feature is the next new add-on you will appreciate. It is developed to ease the process of managing of complex projects. The feature allows showing on the layer and hiding certain objects from the design you are working on with the current layer being still visible. You can also group objects and manage (hide or show) the group. This option reduced the quantity of undos as well as allows you to us workspace more efficiently. Copy curve segments is another option simplifying and advancing the process of design production as it allows you to copy and paste necessary parts of elements within the project. Reuse the copied elements wherever you need. Moreover the copied segments can be exported to other projects you design within the CorelDRAW Graphics Suite X8. Gaussian Blurring feature allows for non-destructive blurring effects applied to a picture. The option features various controls allowing for the greatest precision of blurring and saving the size of the objects against the background and blurred elements. The CorelDRAW Graphics Suite X8 offers workspace customization for great productivity right from the start: you can change the colors of the background and frames, change the size of text and icons.